Heavy snow squalls for the drive to work this morning. The drivers were pretty sensible today. That was refreshing. It would have been nice to bike commute. 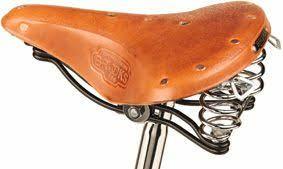 I'm going to give the Brooks saddle another try. The B67 did not work out at all and I'm giving the B17 a try. It even looks better on the Giant. We will see on Sunday. The 17 does not have the springs and is quite a bit narrower. The width of the 67 was a problem for me and I really hope that has been solved. "Winter Solstace" is almost upon us, and daylight will increase in the evenings. That is what stops me from biking to work. The evening commute in darkness is too chancy. I figure late January there will be enough light to do that again. Morning darkness is not so much a problem with so little traffic. (Heavy traffic could be too distracting for the hurried evening drivers to notice a bike in the darkness). Sunday looks good for riding with a camera. 60F and Sunny.